As we get closer and closer to LG’s event on May 27th, we’re seeing more and more leaks of their upcoming LG G3. It’s going to be the successor to the LG G2 which was released last year and it was a beast. I know, I’m a huge fan of the G2, but you can’t fault how great of a phone it was – although the software is another story. Now we’re seeing more and more leaks for the LG G3 which will be official later this month. This time it’s leaked out in yet another case. It looks like another TPU type case, and looking at the front it looks exactly like the G2, same wallpaper and all. But the back is where it all changes. As you can see there’s been a slight redesign to the back buttons. There’s also something on the left side of the camera, not sure if that’s an IR blaster or what it is. They’ve also moved the speaker to the back instead of keeping it at the bottom, unfortunately. Judging by the holes on the bottom of the case, it looks like the microUSB charging port and the 3.5mm headphone jack are on the bottom of the device, of course we could be absolutely wrong here. It looks like a great device, and it’s going to have an amazing list of specs. So far we’re looking at Snapdragon 805, 3GB of RAM, 32GB of storage, 3200mAh battery, 5.5-inch QHD display – that’s 2560×1440 resolution. Oh and Android 4.4.2 KitKat. It’s going to be a pretty amazing device, one that I’m excited to get my hands on. Are any of our readers out there looking to get their hands on the LG G3? Or does some other phone have your attention right now? Let us know in the comments below. 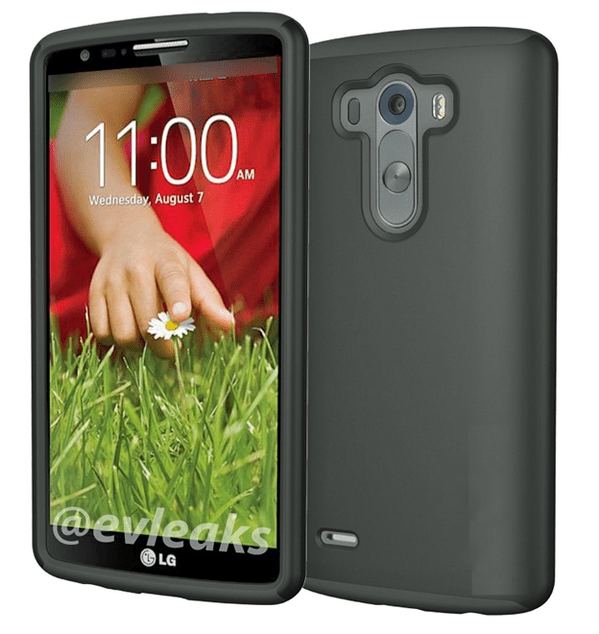 The post LG G3 Leaks Out in Yet Another Case appeared first on AndroidHeadlines.com |.